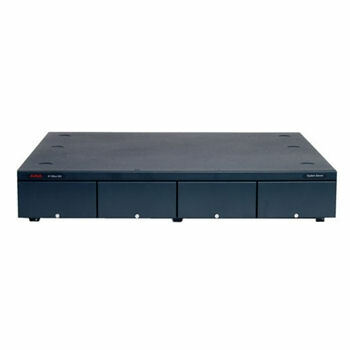 The Avaya IP500 Control Unit is the main processing unit for the IP Office IP500 system. IP Office 5.0 or greater provides support for up to 384 users. 4 Base Card Slots - Can accommodate Digital Station, Analog Phone, and VCM base cards. Also accommodates the Legacy Card Carrier. Trunk Cards - Supports IP500 trunk daughter cards connected to IP500 Base Cards. Also supports IP400 trunk cards using the Legacy Card Carrier. 8 Expansion Ports - Compatible with Digital Station 16/30, Phone 8/16/30,So8, WAN3, and Analog Trunk 16. 1 Dedicated Feature Key Smart Card Slot - Used for Smart Card Feature Key. Required for control unit use and activation of application licenses.